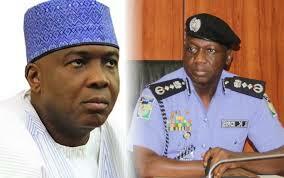 Police Suggest Saraki Stage-Managed Early-Morning Siege To His House – Royal Times of Nigeria. The spokesman of the Nigeria police force, Jimoh Moshood, has said that the siege at the residence of Senate President Bukola Saraki was stage-managed for public sentiments. Speaking on a television program today, Moshood said the force has no hand in the incident. In the early hours of Tuesday, some police vehicles and officers were seen stationed at the entrance of the senate president’s residence in Abuja. Footage which emerged online also suggested that the officers were trying to block his convoy from leaving the area, although Saraki later made it to the national assembly. The incident generated widespread criticisms of the force, with some Nigerians describing it as a clampdown on the nation’s democracy. But speaking today, Moshood said there was no official command for a deployment of police officers to the senate president’s house. While explaining that the force has a responsibility to protect the Senate President, Moshood said over 40 security personnel of the police are attached to Saraki. The force spokesman also noted that the Police had earlier invited Saraki to appear at the Intelligence Response Team Office in Asokoro Extension Abuja, at 8 am on Tuesday, adding that the force therefore has no reason to block him.